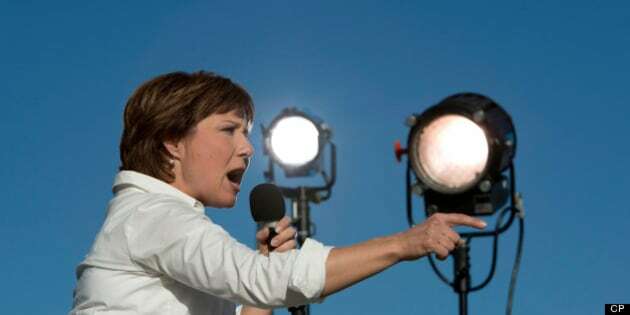 Christy Clark is nothing if not feisty, as she refuses to allow internal party plotters to dampen her resolve heading into voting day next week. The Liberal Leader slammed the so-called "801 movement," an internal coalition of businessmen and party operators that is allegedly looking to oust her after the election, as a selfish group of turncoats who want the NDP to form government, Global News reported Thursday. But the May 14 election is likely to serve as Judgment Day for all four leaders of B.C. 's major parties, Vancouver Sun columnist Vaughn Palmer wrote Thursday. Clark, he writes, has always had a tenuous hold over her party, but she has managed to close the gap with the NDP, coming to within four per cent of the presumptive front-runner. If her party makes a breakthrough and wins a substantial number of seats, she could even stay on as opposition leader. NDP Leader Adrian Dix, meanwhile, should also watch out come May 14. The party is unlikely to lose the election but the NDP, historically, has been very tough on its leaders when they don't meet expectations, Palmer wrote. Whoever wins the election, it's difficult to say who'd be the better manager in government. A UBC study looking at successive governments since the '90s found that the NDP have a better overall record of managing spending and debt, but that depended who was premier, The Canadian Press reported. UBC Professor Tsur Somerville said NDP premier Mike Harcourt had a better record of fiscal management than even the Gordon Campbell Liberals, although both did a better job than former NDP premier Glen Clark.